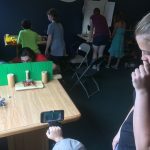 This article is a case study of how I helped develop and run a summer animation camp for a group of 16 very enthusiastic kids. Myth: We Should Wait For the State To Provide A Quality Creative Education For Our Children. One of the developmental creative myths that I address head-on is the idea that we have to rely on other people or organizations to give our kids good artistic opportunities. It’s no secret that school funding for creative development programs has decreased across the board. Even where the public education system isn’t in a state of crisis, it’s very difficult to find quality education for our kids that’s funded by our good old tax dollars. There are programs here and there, or institutions such as magnet schools, but those opportunities are few and far between. They have a waiting list a mile long, are geographically impossible to access, or other barriers to entry. Well, we can complain about it… or we can do something about it. By making grassroots-based creative opportunities ourselves. At the same time, there is an amazing husband and wife who teach drama classes at the school, and they did a drama camp this summer that my daughter was involved in. 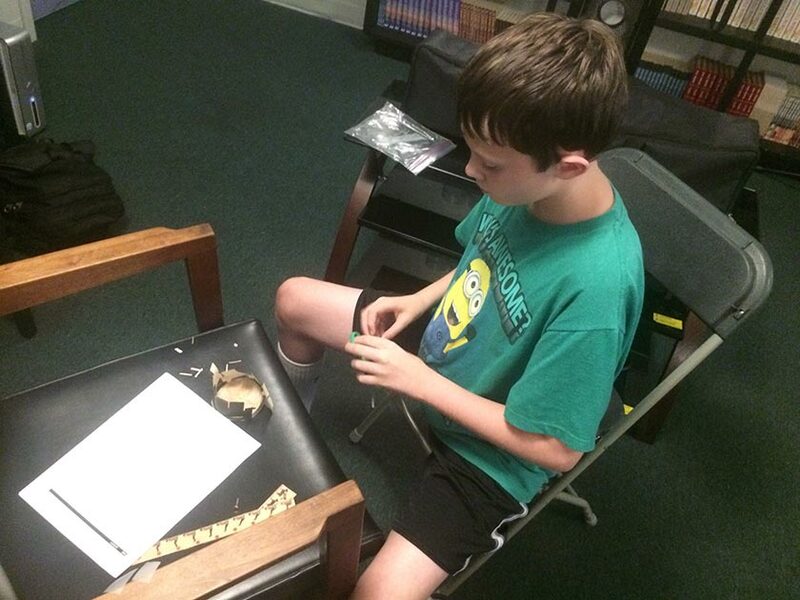 In less than one week, the kids planned, built sets for, rehearsed, and put on the play “Robin Hood”. Everyone was stunned at how well it came together in just one week. A few weeks later, they did the same thing for a music camp. Again, the kids rehearsed and did an amazing performance in just one concentrated week of practice. I talked with them about these camps and how much the kids enjoyed doing them, and how amazing it was that they were able to accomplish so much in one week. 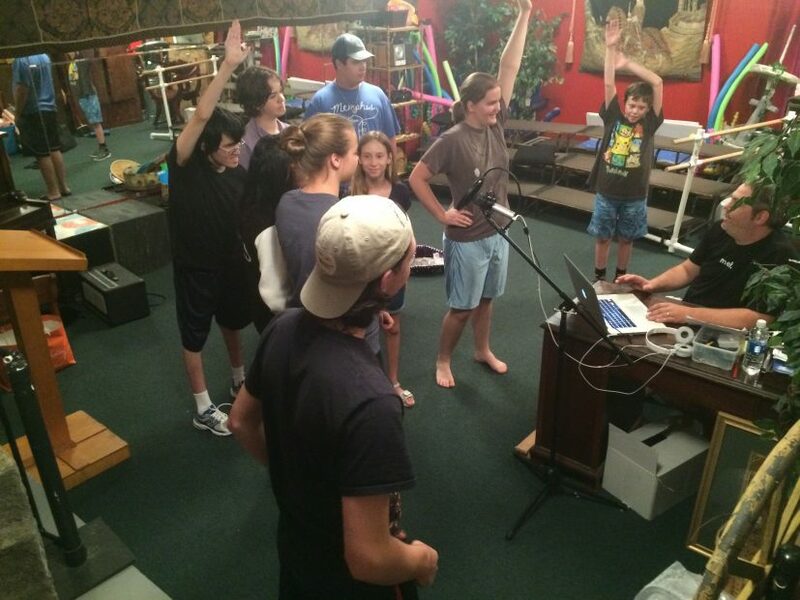 We began dreaming about an animation camp where kids could learn about the art of animation. The kids and their parents could come to a screening of their animation on Saturday evening. Word leaked out, and before we knew it kids throughout the school were already excitedly talking about it! We planned the camp for mid-August. 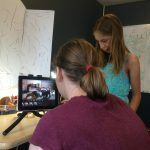 There were a number of challenges to figure out… namely, how will we teach the kids enough that they would need to know about animation in just a few days? Not only that… will we have enough content to show at Saturday’s screening? Another challenge was the age range of the kids, which was from elementary age all the way up to high school. I wanted to teach some 3D animation, but would the younger set be able to grasp the more technical aspects of what I wanted to teach them? As I began to think more and more about the logistics of how this camp was going to be run, I began to wonder… how are we going to make this happen? I came up with a basic curriculum that included some of the history of animation as well as why the illusion of motion works. We planned screenings, lectures, and exercises that were designed to break up the time so that the students wouldn’t have to sit too long without doing something. 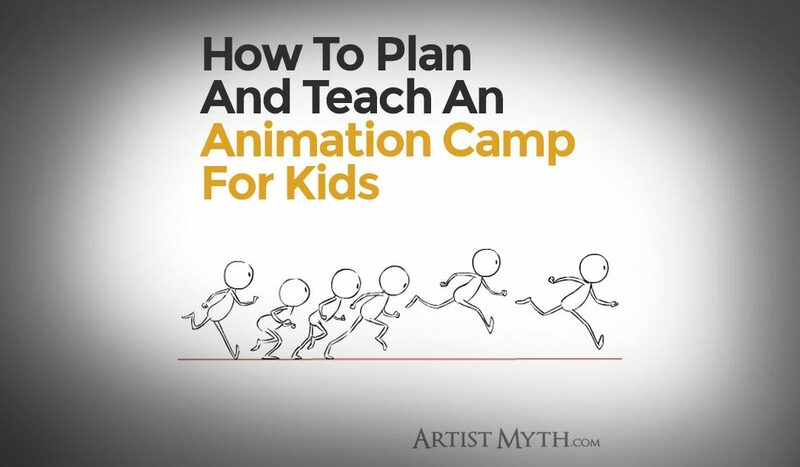 The camp would necessarily be heavier on the instruction side at the beginning, and as it progresses it will be more the students doing their own animated projects. I gathered DVD bonus material and YouTube videos that would provide some instruction as well as screenings. I would pause and talk about what we just learned. The best way to do this was to use our family Apple TV so that I could easily stream my laptop to the classroom television. We would fold in the younger students’ times so that they would come in a bit later in the camp. The older kids would incorporate them into their small group activities. There would be four smaller group activities as well as one large group activity. For the large group activity, we would go through all the steps of an animated short, from storyboarding to production all the way to sound effects and editing. The smaller activities would be more independent, with the kids having specific roles such as director, producer, and stage grips to move the stuff around. While we would go over flipbook-style line drawing, and even do a flipbook sketch exercise, we would lean a bit more heavily on the stop motion style of animation as well as 3D animation. This would leverage technology much easier to get more done in less time. I prepared the main room we planned to use (a converted lunchroom) with tables along the windowed walls so that the kids could use the natural sunlight in their stop motion animations. 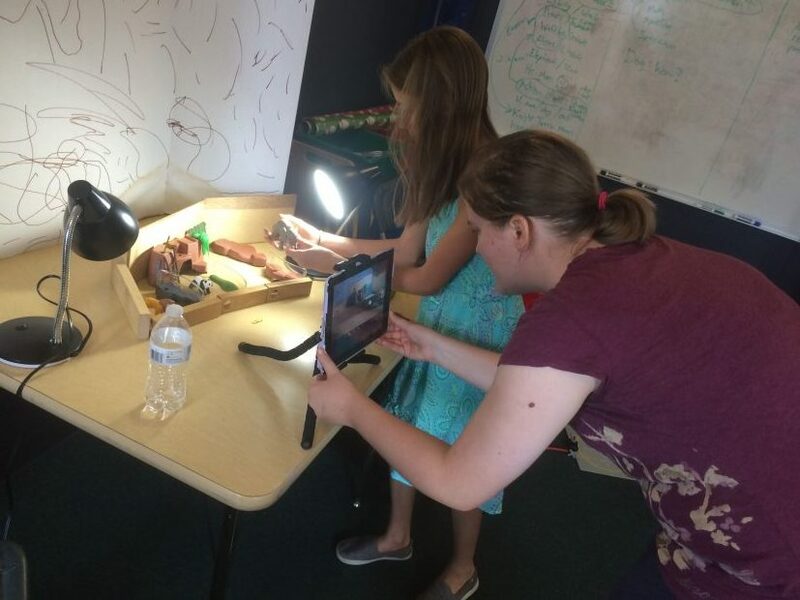 I researched the best app for stop motion and the winner was an app called Stop Motion Studio by Cateater LLC. It’s for iPads, iPhones, and Android devices, and best of all, it has a free version that was basic but good enough for capturing images. I put some tripods at the tables and bought a few smartphone and tablet mounts that would fit with the tripods. I also gathered up some baskets of toys and craft items that would be fun to animate with, stop-motion style. To do the 3D animation, I set up four PC computers with a really cool little program called Minemator. It’s a basic 3d program that has a bunch of Minecraft characters and items that you can move around and keyframe. My plan is to get all the kids’ frames from the devices and the PC’s and throw them into my 1TB Dropbox account, where I can edit them with Adobe After Effects and Premiere Pro. Bryan and Angela (my wonderful co-teachers) came up with great activities, like Pictionary, that we could do in between events. Angela planned and gathered stuff for snacks and meals during the camp, communicated with the parents, and gathered the fees up front. Bryan helped me teach and he ran the in-between activities that we were going to intersperse throughout the day to keep things lively and help the kids build rapport with each other. I also found out that these activities served another purpose… they helped us see their personalities and how the kids interacted with each other. This observation would help us cast the kids in their small groups most effectively. So, with the room prepped, the parents and kids ready, and a schedule in place, we were as ready as we were going to be… let the fun begin! With a couple of last minute signups, we started with 11 very enthusiastic kids. We screened some old cartoons, including Betty Boop, as they rolled in. We did a warm-up exercise and Angela talked about the schedule and I Bryan and I talked about animation and fielded some questions. I screened a Walt Disney video where he talks about the history of the moving drawing. We discussed the phenomenon called Persistence of Vision, which is the scientific principle that makes our eyes retain the images we see. When images are sequenced together, our eyes blend the images together and gives us the illusion of motion. We looked at a lot of the inventions that were made to sequence images, such as the zoetrope. Not only that, we made our own zoetrope out of cut paper and tape. 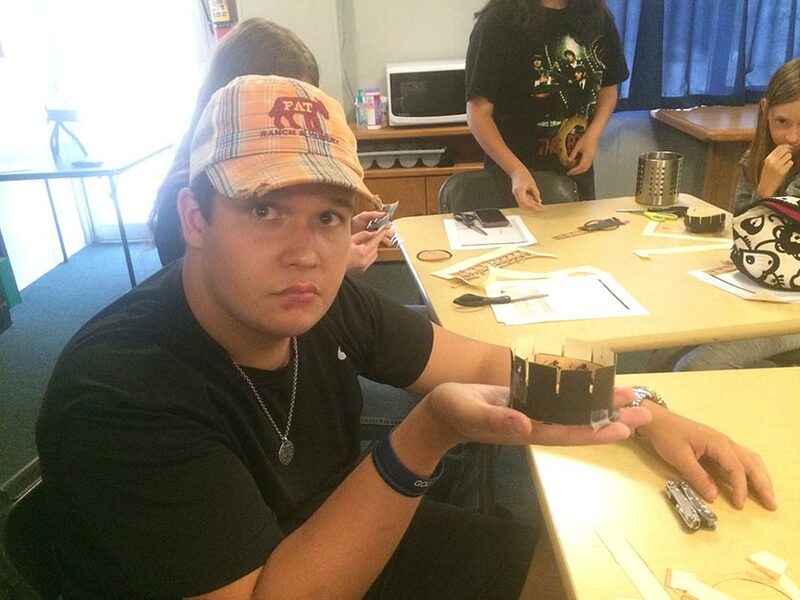 Holding up a finished Zoetrope! When you spun it around the pin that was stuck through the bottom, you saw an animated image through the slits in the side. After our Zoetrope activity, we took a snack break and screened some more animation history courtesy of Walt himself. We watched a Snow White feature that went though all the steps of making a classic Disney movie. This gave us a chance to stop and talk about all of the steps involved in traditional hand-drawn animation, from story sessions to rough animation, to inking and painting the animated “cels”, which were clear celluloid sheets that were to be placed over the backgrounds when the animation was photographed. We wrapped the day with a fun Pictionary exercise and then cleaned up. We had a great start! After a quick continental breakfast (while some old cartoons were playing, of course!) we discussed small group assignments. These would be the groups that would do their own animation projects. After that, we engaged in our live drawing exercise. We screened a bit of the movie Bambi, featuring the lovable Thumper. From the school’s animal lab we got two rabbit “volunteers” to pose for us while we drew them in various stages of action. This helped us to observe and understand not only the underlying structure of characters in motion, but how they looked in those poses. Disney had his animators do this very activity in order to prepare them for animating the animals in his features. 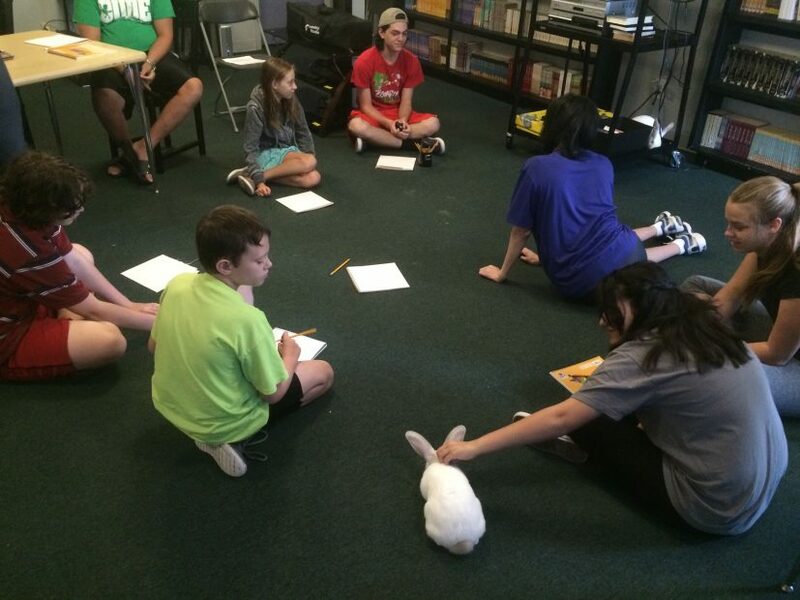 The bunny rabbits from the school’s animal lab seemed to enjoy a break to hop around… and we got to study and draw them! We then did a flipbook exercise. The kids learned that if they can draw a circle, then they can animate! They drew a circle and then flipped the page, where they drew the same circle in a different place. 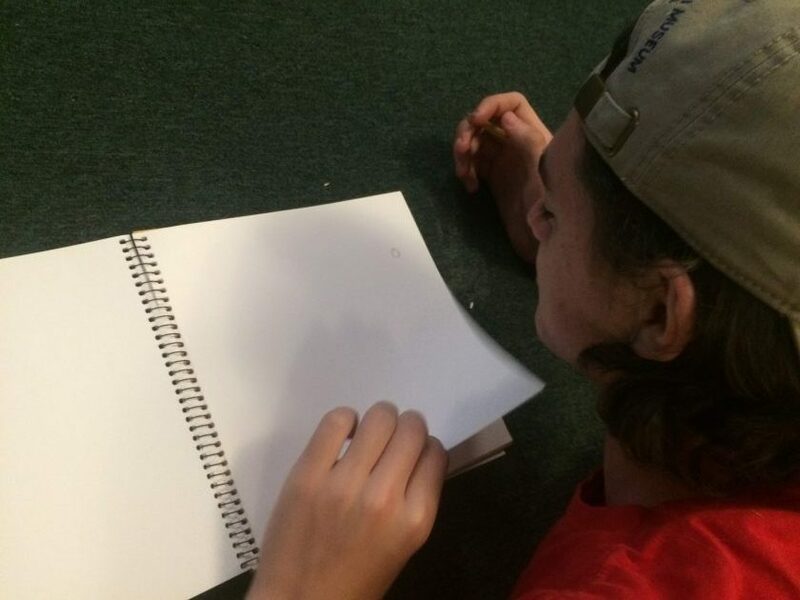 They continued through the rest of the pages in the same fashion, and they observed that when they flipped the pages the illusion of motion was present! In our flipbook exercise, we learned how to animate a simple shape and flip the pages to observe the illusion of motion. Next up… the art of storytelling! 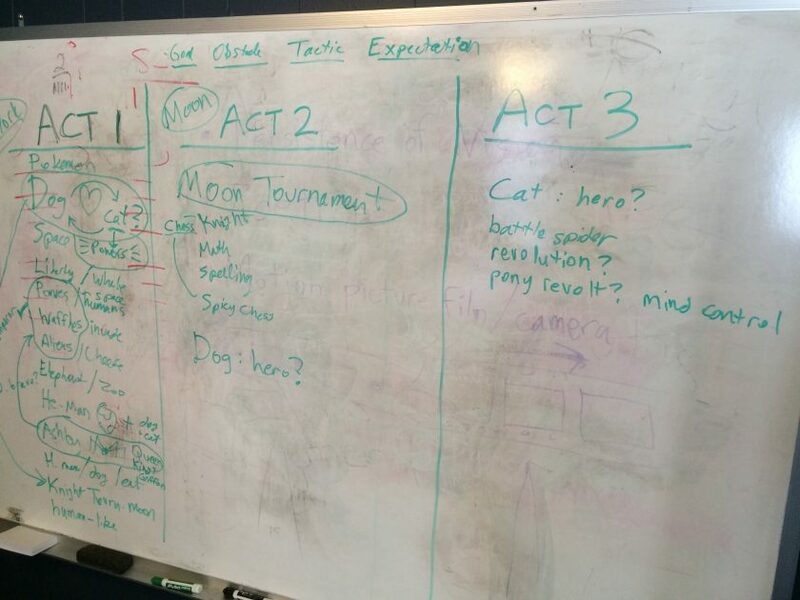 We learned about the three act story structure that just about every narrative has. We put that into action as we did a story session to figure out our big group project’s story. We made three columns on the dry erase board and brainstormed together. The story features a dog and a cat who fall in love and then get abducted by alien ponies, who take them to a battle arena on the moon. After that, we learned how to photograph stop motion and got into our small groups to try experiment with some stop motion techniques. In just a short time, the groups had some pretty great animations started! We set those aside so we can review them in our dailies session scheduled for the next day. With that experience fresh on our minds, we screened a featurette about the making of the Tim Burton’s Nightmare Before Christmas, a tour de force of stop motion animation! The kids learned how much work goes into stop motion and the dedicated team of artists working together that’s required to make such an amazing film. All in all, it was a very busy day! We were pretty worn out, but we were looking forward to the next day, when we would work with the little kids and then work on our small and big group projects. Today we added the group of younger kids who signed up for the camp. We had them for a couple of hours, and we started by talking to them about the basics of animation and then we did the Zoetrope activity. The older kids helped them construct their Zoetrope, since they had already done theirs. After the little kids left (they were only there for half-days) it was time for the older kids to work on their big and small group projects. Building on the story session we started the previous day, I shared the script I wrote the night before incorporating all of their ideas. I had also sketched out storyboards on index cards that we taped up on the dry erase board. This was a great exercise, and I could clearly tell the kids liked it, too… their eyes lit up with interest when they saw their ideas taking shape in a real story right there in front of them! I had put in little jokes and funny things. It was a short little script, no more than 2 1/2 minutes when read aloud, so it should be doable in the short amount of time we had. With this story experience fresh on their minds, we then broke into their four small groups to work on their individual animation projects. I had them draw out their ideas on storyboards and present them to us. We had some great interactions with the kids here, helping them craft a story that has some kind of 3 act structure as opposed to a random series of events. From here on out, the kids would be involved in production on both their individual projects as well as their group projects pretty heavily. We knew we would need to front-load the camp with instruction and exercises, and then step back and guide them through their projects. While they attacked their tasks with enthusiasm, there always emerges a few leaders in the group and a few kids who tend to fade back. We were aware that this would happen and we were ready to offer advice as to how to involve everyone in the process. Angela and David’s first hand knowledge of the kids here was absolutely indispensable… they had structured the groups so that the chemistry would be the best mix of personalities and abilities. With that said, we did have a couple of minor squabbles… and a bit of divergence in group goals as well. This latter thing was my fault, because I wanted to offer a few computers with Minemator on them for those kids who were interested in 3D animation. There were a couple who wanted to do this, but one in their group did not. We were able to shuffle some group personnel a bit so that one group of three was able to do an animation in Minemator, and the other three groups did stop motion. The Minemator kids were very excited… they had never done 3D animation of any kind before, and they really took to it. They learned basic file management, how to create keyframes, and how to place the camera and render out their animations. 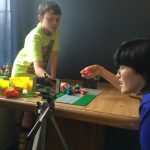 Minemator took away all the busy work of modeling and all the other prep work that goes into 3D animation, and allowed the kids to just tell a story with the existing props and characters. Of course, since they liked Minecraft, they were totally ok with this! Day three was a very busy day, but we still had a lot of work ahead of us if we were to complete five animation projects before Saturday’s deadline on Day 5! Could we do it? We screened some Looney Tunes shorts as the kids filed in and munched on the granola bars and fruit that we had set out. Some of them even went ahead and started on their animation projects without us asking them to! 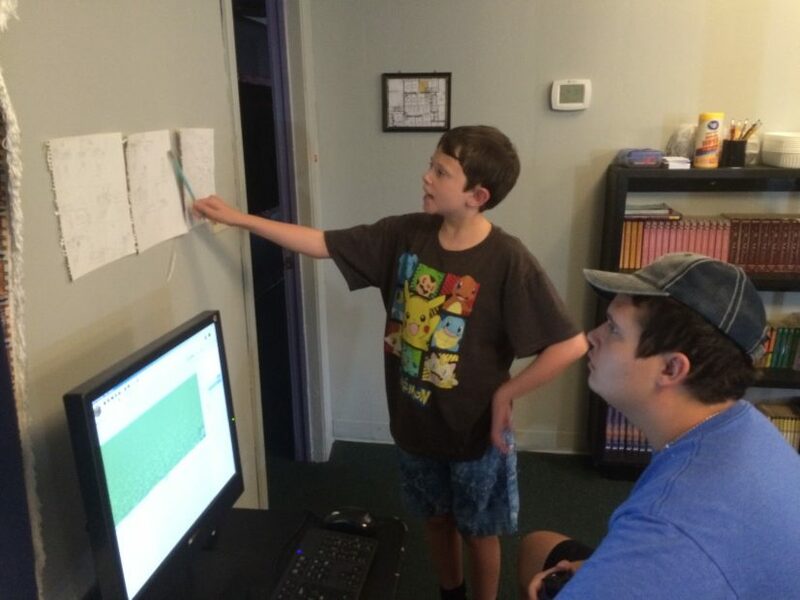 The little kids brainstormed, set up, and animated their animation project (the boys were their own small group, and the two girls helped another group.) It was a really funny animation of animals saving the earth from an asteroid. After the morning’s animation production (both small and large groups) we took a break and screened some more instructional videos. Then Brian, a stage actor and voice over artist, talked about voice acting and sound production. By the end of the day, we were able to get a couple of small group movies finished, but there were still a lot of frames to do… I would have to work on a lot of editing and getting their stuff in the next and final day… it would be tight! This was it… the big day! I was going to have to really cut some corners to get all the animations into the five o’ clock screening for the parents. The little kids helped us animate titles for the main presentation. I had set up an old TV stand as a makeshift top-down animation setup. This allowed them to animate things on a tabletop with a camera that looked down on the table. To animate the titles, I had them punch out some letters and position them on the table, then move them off the table bit by bit as they took a picture. That way, I could run the footage backwards to make it look like the letters were appearing on the table, and then appearing off again. The little kids were old hands at this by now, and were able to (with a bit of guidance!) organize themselves into an efficient film unit! As the kids finished their animations, I had them share them via Dropbox. This was really easy to do, and it all went to a single place in my Macbook Pro so that I could take them and edit them with sound in Adobe Premiere. There was a great turnout among parents, relatives, and friends of the kids who had worked so hard during the week of camp. Bryan got the kids to describe for the audience what they learned, and we had an interactive question and answer session. Then the lights dimmed and we presented the First Inaugural Flint Animation Camp Student Reel! It was extremely well received. The students were amazed to see their hard work all put together with audio and everything. While I didn’t have a lot of time, I was able to get a little bit of “production value” in there! While the camp was a roaring success, there were a few things that I would definitely tweak for next time we do it. The schedule was too ambitious. I think I just tried to cram in too much for this first camp. While a single group animation would’ve been fine, or a collection of different group animations would’ve been fine to present a the screening, it was just too ambitious with the schedule we had. If I had one more day (started on Monday instead of Tuesday) then we could’ve gotten there. 2. The little kids were a bit too much. I have nothing against smaller kids, but their addition was just a bit too much. It was great to have the older kids work with them, but there were always dead spots where some of the older ones (which outnumbered the younger ones) had nothing to do. I also felt like I spent way too much time trying to focus their attention on the matter at hand, and dealing with the inevitable behaviors that occur with that age. There were also some concepts that they just weren’t able to grasp. The age difference between them and the older ones was just too great to overcome gracefully. 3. I would have more instruction and practice in 3D animation. Like I had the kids all do build their Zoetropes and do their flip book animations, I should have planned in some time to have them sit at the computer with MInemator. They could have at least gotten a passing knowledge of it, which is important since the bulk of animated films nowadays is in 3D. But the tabletop nature of the stop motion ended up being great. What do you think of the camp? What would you have done differently? I’d love to hear feedback, because I definitely want to make the camp better in the future. 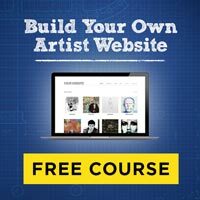 I also want this to be a resource for anybody who may be looking into hosting any kind of workshop, camp, or event around 3D Animation! So please share it with everybody you know who might be interested. Thanks, Michael… we may not be making the next Star Wars, but we are learning a lot about the basic principles of animation! We’re also having a lot of fun in the process. Just like you, I never had anything like this when I grew up either – nor did I know if anything like it existed. I”m just glad we’re giving these kids the opportunity to experience it.